Flood Watch – Lake Erie Shoreline / Erie Shore Drive – April 3, 2018 – 11:00 a.m. Environment Canada has issued a Special Weather Statement for the region calling for “significant rainfall later today and tonight followed by strong winds beginning early Wednesday morning”. Their Marine Forecast has also issued a Gale Warning for western Lake Erie. The strong sustained winds are expected to begin late this evening from the south at around 35 km/hr. Those winds will gradually increase and shift to the southwest peaking Wednesday morning at around 50 km/hr. Wind gusts are predicted to reach 80-85 km/hr. The Marine Forecast suggests sustained winds over the lake could reach 70 km/hr. The winds will then begin shifting to a more westerly direction and gradually decrease over the day before finally becoming moderate winds from the northwest overnight Wednesday/Thursday. Throughout most of this event wave heights are expected to exceed 2m, with 3m waves expected Wednesday morning. While winds remain from the south and southwest, the waves will be driving onto our Lake Erie Shoreline in Chatham-Kent and Elgin County. There is a risk that wave action could damage shoreline protection works and cause shoreline erosion. Vulnerable areas could see localized flooding due to waves crashing against shoreline protection works spraying water up onto the land. 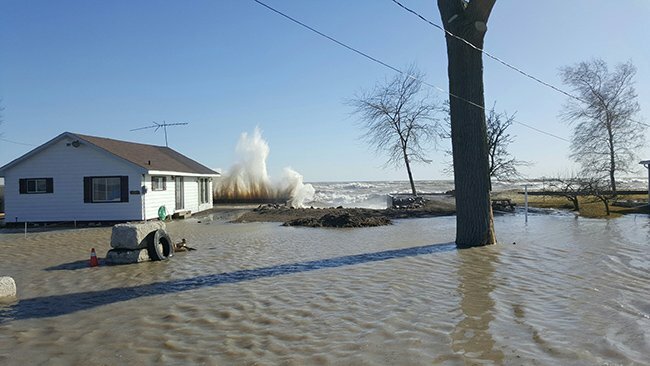 Recently flooding had occurred along Erie Shore Drive in Chatham-Kent when the area experienced sustained winds above 35 km/hr from a southerly direction (southeast through southwest). Therefore, the forecasted wind speeds and direction are expected to cause flooding in this area. As the predicted wind speeds are greater than those experienced during the last few events over the last week, residents should prepare accordingly. People should take extra caution and avoid the shoreline. The waves can be strong and the shoreline slippery. There could also be hazardous debris within the waves and water. Standing water can also present its own unseen hazards. Children, pets and livestock should be kept away from the water. This message will be in effect until April 5th, 2017.